Easter Cake Pops are an adorable and delicious Easter dessert perfect for any Spring gathering! Made easy with spruced up store-bought cake mix and frosting, this treat requires only a few ingredients and comes equipped with easy-to-follow instructions. Once your ingredients come together, the cake and icing mixture is molded into the shape of an Easter egg for a fun and festive treat, coated in melted candy wafers and decorated with sprinkles! Whether or not you attach them to the lollipop stick is completely up to you. 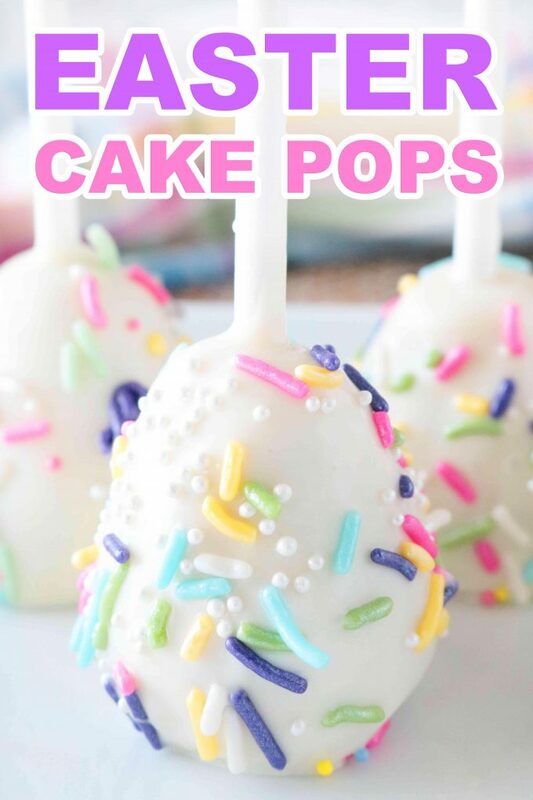 They’ll stand up just fine on their own — no special stand or styrofoam needed for these cake pops! 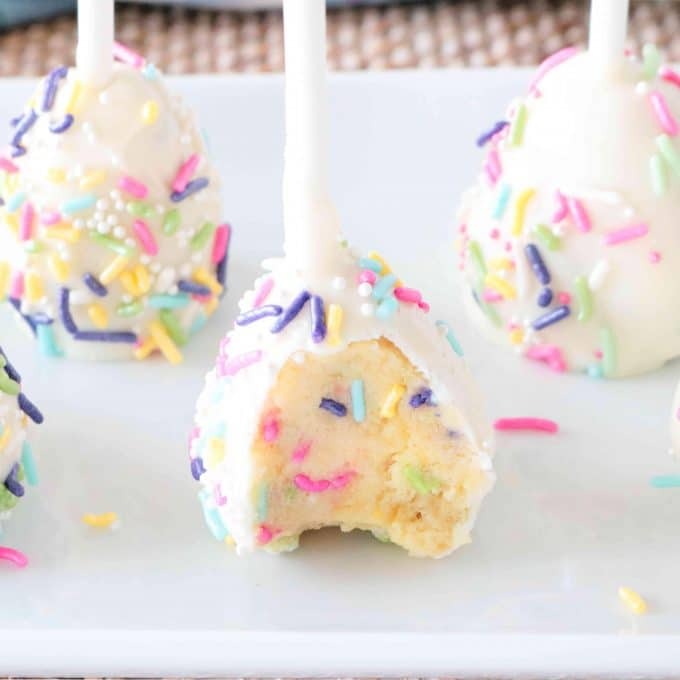 The Easter Cake Pops shown here were made with yellow cake mix and vanilla frosting, but when it comes to making these Pops, you really can go any direction the wind takes you when it comes to flavors. However, if you want to see sprinkles within every single bite, it’s recommended that you steer clear of chocolate and go with either a white or vanilla cake mix. The same goes for the frosting — the darker the frosting, the more difficult it will be to see the sprinkles inside. If the sprinkle factor isn’t a deal breaker for you, and you’re a chocoholic, by all means — go chocolate all the way! Melting candy wafers can be found in the baking aisle of your grocery store (usually near the chocolate chips) and also within specialty craft stores. Ghirardelli Melting Wafers are considerably easier to work with than any other brand of melting candy wafers. Even though they might run $1-2 more than competing brands, they are highly recommended as they tend to stay smooth and much easier to dip into. You’ll find that extra buck or two well-worth it. Because of the way these Easter Cake Pops are shaped, you do not necessarily need lollipop sticks. However, they will make dipping the Cake Balls in the melted wafers a little less messy and the kids tend to adore them. You can find lollipop sticks in most grocery stores located in the baking aisle next to the sprinkles. If your grocery store does not carry them, you can find them in the baking sections of craft stores like Michael’s or Hobby Lobby. 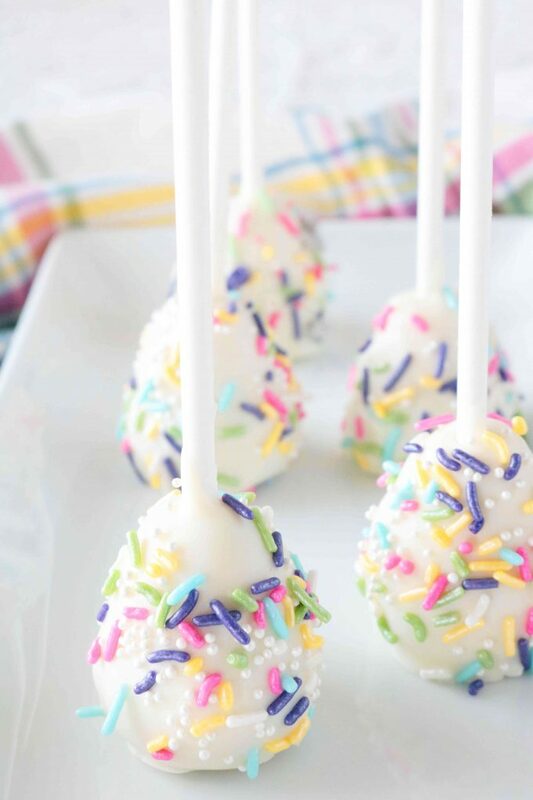 You can use any type of sprinkles you like for these Easter Cake Pops, but pastel colored Jimmies and white nonpareils make for an especially festive Easter Egg. Bake cake and break up into crumbles. Shape into eggs and place in freezer for 1 hour. Add lollipop sticks, dip in melted wafers and decorate. 1. BAKE THE CAKE…THEN BREAK THE CAKE! The cake you bake for these Easter Cake Pops is going to be ultimately be destroyed. It’s best to not get too attached, and for this reason, boxed cake mix it is. You can make your box cake mix taste homemade with a mere teaspoon of pure vanilla extract. To do this, make the cake batter according to package directions and before baking, add a teaspoon of pure vanilla extract to the cake batter and stir to combine. Bake your cake according to the boxes directions for a 9×13″ casserole dish, but don’t forget to add the extra teaspoon of vanilla extract! As soon as the cake has baked and cooled, transfer it to a large mixing bowl and break it up into crumbles. 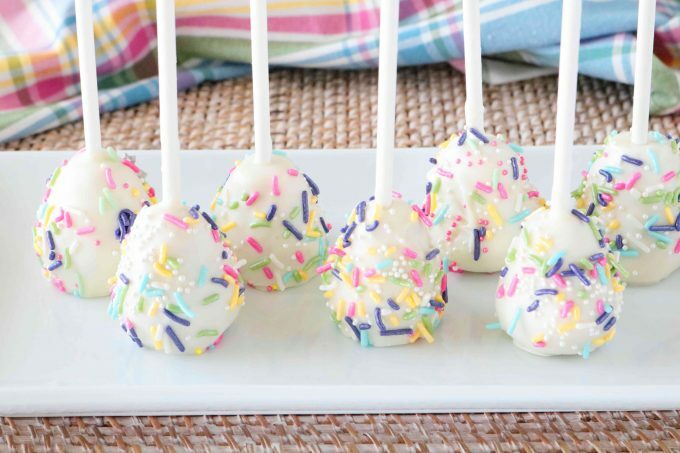 If you are using sprinkles inside of your Easter Cake Pops, now is the time to add them! Add the frosting, along with a generous pinch of salt to the crumbled cake and stir until well-combined using either your hands or a sturdy wooden spoon. The added salt helps to compensate for the sweetness of the candy wafer coating. 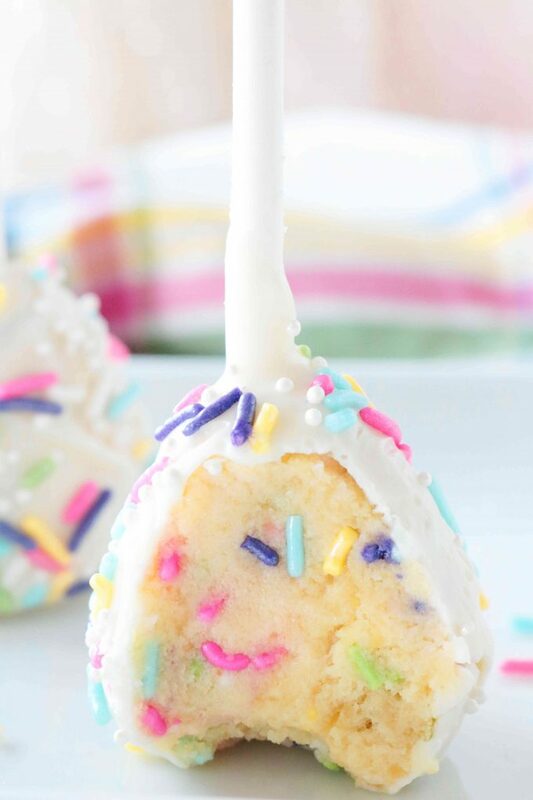 Because you’re adding icing to your cake pops, you can expect the texture to be very moist and almost sticky. This is completely normal…and totally delicious. Once you’ve got your mix ready, it’s time to roll them into balls, and from there, into eggs. To do this, scoop up about 2 scant tablespoons of the mix (a medium-sized cookie scoop will help to keep the cake balls of uniform size), and roll into a ball using damp, cupped hands. Cupping your hands while rolling into balls will help it to round out nicely. After the Cake Pops are rounded out, taper the top end to look like an egg and transfer them to the freezer. Freezing the Cake Pops is an important step in undergoing the transformation from cake ball to cake pop. The cake balls will need to stay in the freezer for at least 1 hour. It’s best if you can freeze them on a flat surface, such as a baking sheet lined with wax paper, however, if you can’t fit a baking sheet in your freezer, you can gently stack them in a food-safe storage container. Be sure you use wax paper in between the layers of the cake balls to keep them from sticking to one another. 4. MELT, STICK, DIP, AND SPRINKLE! Decorating goes by quickly and candy wafers harden fast so have your materials laid out and your work surface before you begin melting the wafers. Melting candy wafers is the easiest part. Melt them according to package directions and it’s time to dip. The narrow frame of a 1-2 cup Pyrex measuring cup makes it much easier to fully submerge the cake pops. I usually melt all of my wafers in a larger bowl and pour a cup or so into the measuring pitcher as I go. Start by dipping the end of the lollipop stick in the melted wafers, then place the lollipop stick in the center of the Cake Ball, about 3/4 of the way down. Submerge the entire egg in the melted wafers, and allow as much excess to drip off as possible before decorating. Be sure to set them on a nonstick surface after they’ve been dipped. Wax paper works best! Melting wafers do not take long to set up, so rather than waiting to add the sprinkles all at once, it is best if you add them almost immediately after the Cake Pops have been dipped. Use boxed cake mix and store-bought icing to save mega time! Buy Ghirardelli Melting Wafers over less expensive brands – the headache they’ll save you is priceless! Plan ahead — don’t forget you’ll need time for the cake to cool, the cake balls to freeze, and time for the melting wafers to set up. Use damp hands to roll the cake balls. This helps to keep the batter from sticking to your hands. Rolling the cake balls with cupped hands will make it easier to get them into a round shape. Freezing the cake balls before dipping them in the melted wafers is an absolute must. Have your work station prepped and materials ready before you begin dipping and decorating your Easter Cake Pops. 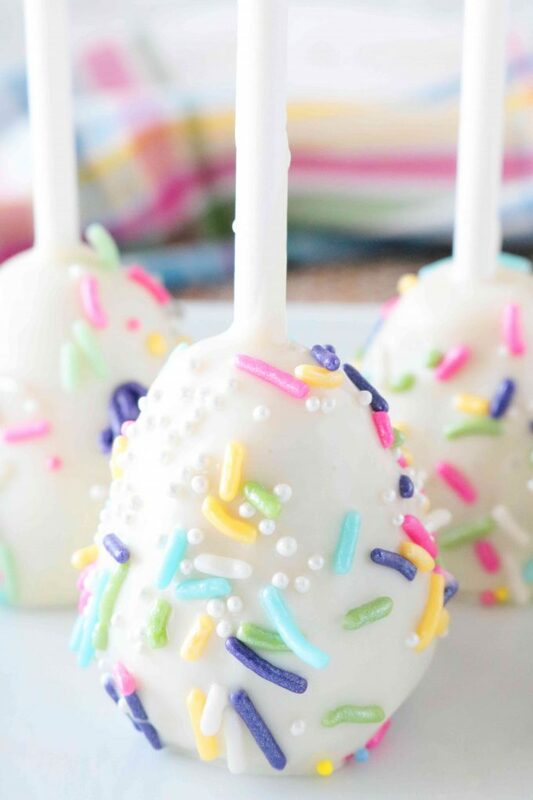 Decorate the Cake Pops as you dip and not at the very end. Candy wafers set up very quickly! If you love Cake Pops, be sure to bookmark or pin these Halloween Cake Pops for October! They feature an adorable trio of spooky cake pops that are especially easy to make! Choose from three Halloween Cake Pop decorating ideas — Ghosts, Mummies, or Little Monsters! Chewy M&M Cookies are festive, simple to make and kid-friendly. Swap the M&M’s out depending on the cookie, and you’ve got a year-round holiday cookie! Egg Hunt Blondies feature chewy blondies topped with buttercream icing made to look like grass and the M&M candies serve as little eggs for a festive Easter egg hunt scene! Brownies with Strawberry Cream Cheese Icing are the perfect Springtime dessert! Perfect homemade brownies topped with a fluffy whipped strawberry cream cheese frosting and a mix of fresh berries. Strawberry Cake Cookies are made with real strawberries! Plus, an optional lemon glaze to go on top for an extra special touch. Chocolate Sandwich Cookies with Raspberry Filling are decadent and absolutely delicious! Featuring a creamy raspberry filling sandwiched between two homemade chocolate wafers. 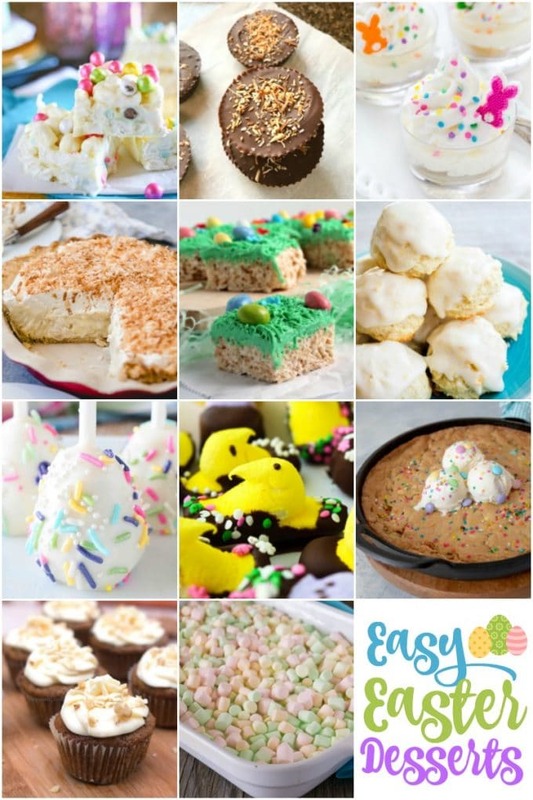 MORE EASTER DESSERTS TO TRY! 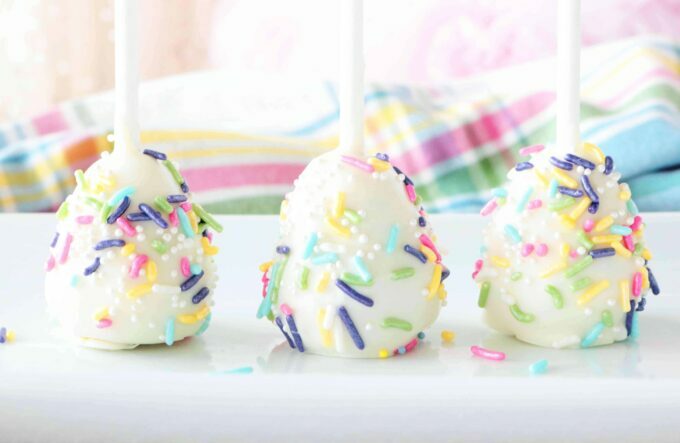 Easter Cake Pops are an adorable and delicious Easter dessert perfect for any Spring gathering! 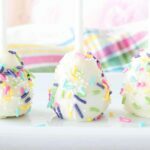 Cake balls shaped into eggs are made easy with store-bought cake mix and frosting, and a simple sprinkle of sprinkles! With cupped hands, roll about 2 tablespoons of the mix into a ball. Taper the top to look like an egg, and set on the wax paper. Repeat until all of the mix has been prepared. Transfer all of the cake balls to a sheet pan lined with wax paper or the storage container. If using the storage container, separate each layer of cake balls with a sheet of wax paper. Freeze for 1 hour. Combine Jimmie and nonpareils sprinkles in a bowl and mix to combine. Set aside until ready to use. Have your work surface and sprinkles ready. Dip the tip of the lollipop in the melted wafers, and then gently insert it into the center of the cake ball, about 3/4 of the way down. Decorate the cake ball with sprinkles right away, before the coating hardens. Repeat with the remaining cake balls. Looks like I found this year’s Easter dessert! These are just adorable. I love those little sprinkles that look the pearls, and the colors are so pretty for spring. Thanks for sharing!